For the users of certain smartphone models there from time to Android apps that can only download it for free. So now also once again the Samsung Galaxy S3, the user can now also the Polaris Office 4.0 free download at Samsung's own apps portal. 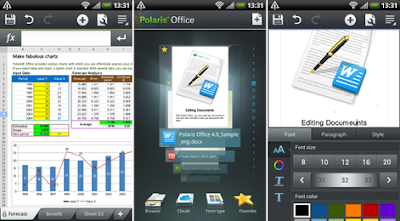 Rarely this Android app is not, some say was Polaris Office preinstalled on various smartphone models from the factory. Thus, the, also from South Korea manufacturer LG installed the Polaris Office (the viewer version jedoch'nur) on the Optimus 4X HD and also the Taiwanese manufacturer HTC introduced the Polaris Office in the One X. The action seems to apply only to the Samsung Galaxy S3, as other Samsung smartphones have the option not to download, Polaris Office 4.0 for free. It is also strange that the action is time available and at a different time of the download does not turn. However, all Samsung Galaxy S3 users download this Android app, so a full-fledged office suite should not be missing on a smartphone. So now who wants to download the Polaris Office 4.0 free package that should go to the Samsung App Store visit there and perform the download. Perhaps Samsung decides to the Polaris Office 4.0 download for other smartphone models for free in the future to offer.